Simplicity. With A Touch Of Elegance. On Your Terms. Take Control Of Your Goals. 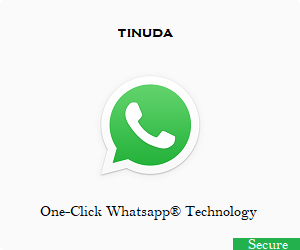 We recently launched our One-click WhatsApp Technology (1WAT) on the site, aimed at improving your, our esteemed users and clients’ experience with TINUDA. Now you can talk with us and place your service requests in your own terms by a single click from here, anytime and anywhere. This option is applicable and available to over 1 Billion people across the world or you can go ahead with our other provided option for seamless service requests on TINUDA, express yourself fast and easy by simply entering the required details in spaces below. Examples have been automatically placed there to guide you, please delete or modify these automatic examples as appropriate to suit your request. Specify when you would like your work/request started and completed. Reference File Upload You may upload an image file you would like be used as reference or copy in executing your request. From Tinuda Showroom or anywhere else. Mobile Number * Recommended: Social media connected number. Ex. WhatsApp. For an improved and smarter experience, kindly enter your most active social media details below. Ex. Instagram.com/tinudainc, facebook.com/tinudainc, twitter.com/tinudainc Etc. Visit our ShowRoom for past works and samples that may be useful in making your own order or service request. In a case of urgency and yet to attend to your request, please use contact details provided below by direct call or messaging.